Smartphones and apps go hand in hand to provide functionality that is hard to beat. Smartphones have quickly become nothing short of a personal secretary to help us sort out various aspects of life into organised compartments improving overall productivity and output. Certain productivity apps aim at reducing the time taken to perform a variety of tasks and improving efficiency. Todoist is an amazing app to increase overall productivity by helping you organise documents and projects with ease. You can easily enter the deadlines of various projects and sync the results on a variety of devices to help you keep track of your activities. You can manage tasks in the offline mode too and reschedule tasks with ease from mobiles, tablets or laptops efficiently to always stay on point. You can easily share your schedule and assign tasks within the app. 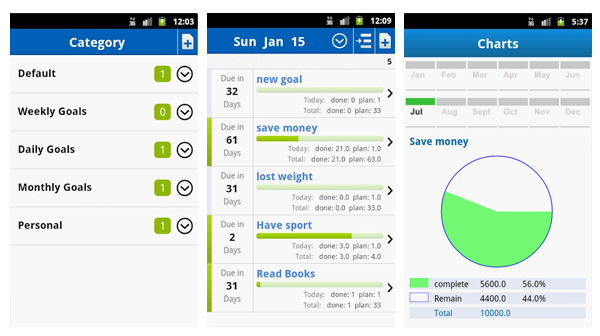 Thanks to the app, you never miss a deadline again and make sure all activities are completed on time. GoalTracker helps you set up goals allowing you to set a time value and target with each goal making sure you meet the timeline. GoalTracker automatically keeps track of the progress you’re making and keeps sending reminders making sure you stay on point. Be it exercising, reducing weight, completing assignments on time or setting dreams and breaking them down into steps, no matter how big or small the goal is, you can now always stay on track to achieve every goal you aim to complete. Dragon Dictation is a wonderful app that makes typing extremely quick and simple by taking dictation and cuts down overall time you spend to type on various platforms. Be it Twitter, Facebook or writing emails, the app has the ability to understand dictation and transcribes with accuracy. The app also has shortcut buttons for quick access and helps you manage typing in a faster and concise manner. 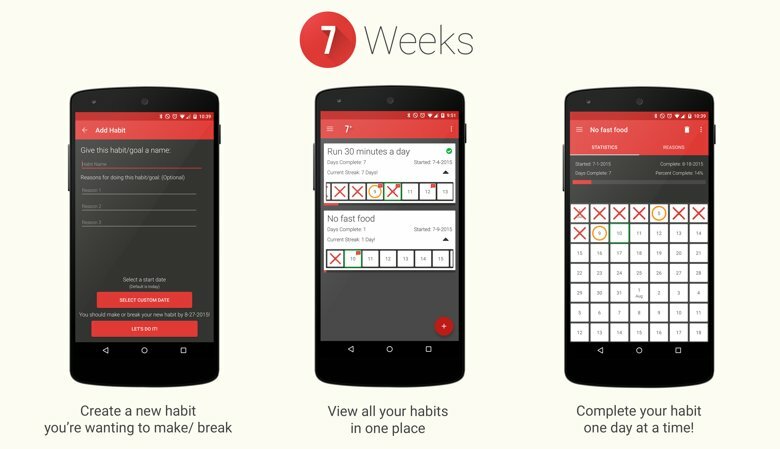 7 Weeks is a revolutionary app that helps you stick to your goals, form a new habit or get rid of a bad one. All you need to do is set a goal and every day when you accomplish the activity at hand you get to mark the calendar putting you a step closer to finishing the activity. The design and interface is easy to use and you can attach customizable notes for each. This surely helps you stay focused on maintaining a daily habit or getting rid of one as you can track your progress easily and can customize the table as per your wish. Mindly is a great app that helps you structure your thoughts and better map your ideas. The human mind is amazing which process a huge amount of data daily which makes it difficult to keep track of good ideas and thoughts. Thanks to Mindly, you can easily pen down your thoughts and ideas to give a speech or presentation as well as prepare summaries for meetings. 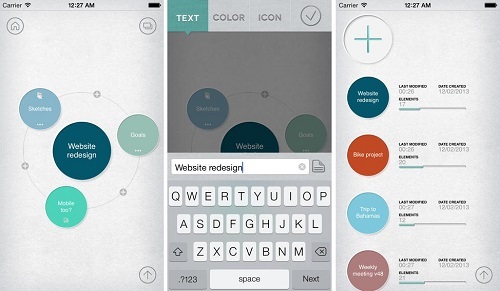 This is a great app that also helps you brainstorm with ease. You can easily add images and sounds to your ideas as well making it all the more comprehensive. Be sure to have these amazingly fun and useful apps that help you stay focused and on point no matter what task is given at hand.